Who's your favorite Supreme Court justice? 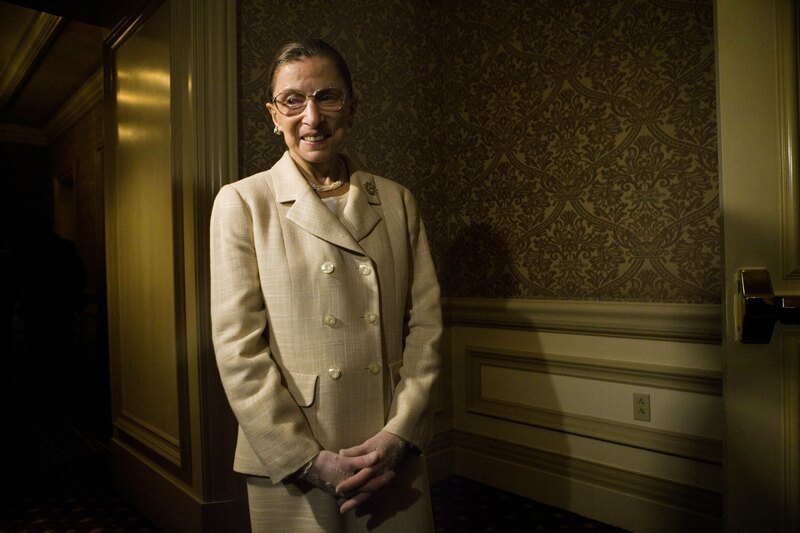 OK, trick question — it'll be Ruth Bader Ginsburg, the inimitable woman of the court's old guard, right? Ginsburg's been serving for over 20 years, having been appointed in 1993 by President Bill Clinton, and has been probably the sharpest-minded and most eloquent defender of women's rights on the court, especially relating to reproductive choice. And that know-how was on full display Tuesday — Ginsburg talked abortion and retirement plans in an interview with Elle, offering optimism about the current political climate, and making it clear to her critics that she's not hanging up the robes anytime soon. It's a really interesting interview, and gives some insight into Ginsburg's opinion of her conservative and liberal critics alike. And, in this case, all American women who value their right to make choices about their own body will be hoping her predictions are right, because Ginsburg believes the current rash of anti-choice rhetoric and legislation will eventually swing back. Phew. But don't get excited just yet — the change is likely to happen "when we have a more functioning Congress." Obviously, that's a big challenge, and maybe feels more "if" than "when" at this point. Ginsburg laid out a few unique perspectives on abortion rights in America, suggesting that in spite of a rash of condemning rhetoric and legal restrictions out of Republican-led states, she thinks things are about at the limit. ... I think on the issue of choice, one of the reasons, to be frank, that there’s not so much pro-choice activity is that young women, including my daughter and my granddaughter, have grown up in a world where they know if they need an abortion, they can get it. Not that either one of them has had one, but it’s comforting to know if they need it, they can get it. ... I think it's gotten about as conservative as it will get. For some perspective on Ginsburg's "young women" comment: While abortion access has never been quite as simple in the U.S. as its constitutionally protected status would suggest, the Roe v. Wade decision came in 1973, meaning that abortion has ostensibly been available to women for over 40 years. As for it being as conservative as it'll get, however, that seems hard to say just yet. The modern-day GOP certainly doesn't seem like a party that's going to budge on the issue, so the real battlefield may be electoral — both this November, and beyond. Nowadays, with the voting ideologies of the nine Supreme Court justices pretty clear, it's not uncommon to see that 5-4 tally at the end of a big case. Usually, it's the five conservative justices — Roberts, Scalia, Thomas, Kennedy and Alito — against Ginsburg, Breyer, Sotormayor and Kagan, the four ostensible liberal votes. And to hear Ginsburg tell it, Justice Kennedy's inclusion in the former group, specifically on abortion-related rulings, is a shift over time that's pulled the court's abortion-related rulings to the right. To be frank, it’s one person who made the difference: Justice [Anthony] Kennedy. He was a member of the triumvirate used to [reaffirm] Roe v. Wade in the Casey case, but since then, his decisions have been on upholding restrictions on access to abortion. If there's one thing Ginsburg isn't having, it's many liberal and Democratic observers having piled on in calling for her retirement from the bench. This does make some sense, even to me — at 81, Ginsburg is the court's oldest justice. Obviously, she's got a lifetime appointment, so it's up to nobody but her to decide when to quit. But if 2016 were, say, the beginning of an eight-year Republican-controlled presidency, Ginsburg would be 91 by the time of the 2024 inauguration. Regardless, however, she's got no plans to leave, and she thinks the people who want her to are being unrealistic. Ginsburg's not wrong about this, exactly — given political headwinds and the stridency with with the Senate GOP has held to obstruction throughout the Obama presidency, it's unlikely that another Supreme Court nominee could be quite the progressive champion that she is and still get confirmed. For the sake of argument, however, Obama appointees Kagan and Sotomayor are certainly not conservatives, and figure to be reliable votes on a host of major issues for years to come. The most meaningful concern for these critics is less whether Ginsburg's replacement will be as steadfast and eloquent a liberal as her, but whether they'll be liberal at all. It might not necessarily take a towering women's rights icon on the bench to uphold abortion rights, for example. But the pro-choice firewall is definitely not going to hold if, say, President Bobby Jindal gets a couple nominees through. Ginsburg clearly has confidence that she'll be sitting on the bench for a while, however, so we'll all have to wait and see.